It has come to my attention that a number of artists are using science as an inspiration for art, and not in the traditional way that illustrators of science fiction novels have for decades. No, these artists are using science as an integral part of their body of work. Take for example, “Angel of the West” (pictured here — click on the image to see a larger view). 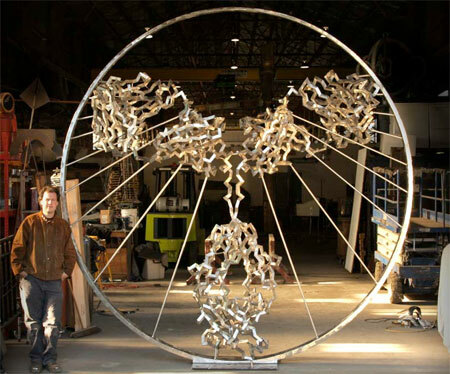 Created by former experimental physicist, Julian Voss-Andreae, for the new Scripps Research Institute in Jupiter, Fla., this piece is based on the human immune system’s key molecule, the antibody, as well as Leonardo Da Vinci’s model of the human body. Originally from Germany, Voss-Andreae has been working as a sculptor in the Portland, Ore., for the past four years. He started out as a painter, but then switched to physics. His graduate research in physics was in Anton Zeilinger’s lab in Vienna and helped demonstrate quantum mechanical wave properties for C-60 Buckyballs. 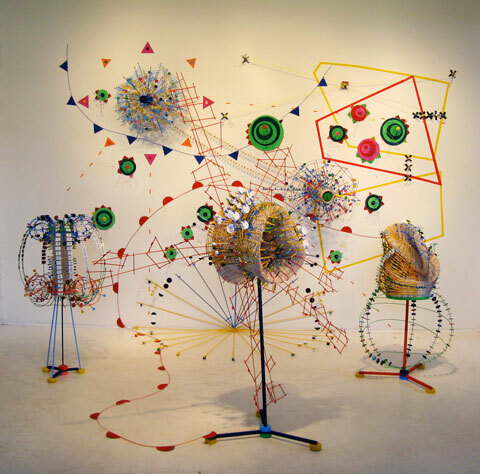 Then you have Nathalie Miebach, an artist who weaves scientific data related to meteorology, climate change, and astronomy into brightly colored, three-dimensional sculptures. A special showing of her work will be held on March 11 at the Boston Museum of Science as part of the ongoing series When Science Meets Art. The Future of Science…Is Art? Check out how art has affected science, and read about various works of art that stimulate specific regions of the brain.